Recently I got a chance to screen the film Inheritance and fell in love with the indie thriller. Inheritance is Tyler Savage’s first feature film and wow, what a terrific debut! A beautiful slow-burn of a horror movie, I can’t stop thinking about how deeply I was drawn into the film! As I shared in my review, I kept leaning into my computer so I wouldn’t miss anything, I was that mesmerized! Please check out my review by clicking here. Synopsis: Ryan Bowman (Chase Joliet) finds out his birth father has died and he just inherited a 2.5 million-dollar beach house. Having thought his real dad was already passed, he and his pregnant fiancé Isi, (Sara Montez) go to see the house. Once there Ryan’s interest in finding out more about his father piques and he stays in the house instead of following the instructions his father left him, “Sell the house immediately.” Whether supernatural or psychological- Ryan pushes his fiancé away, learns some horrifying things about his parents and seems to be poised to repeat past family transgressions. Nature seems to be winning out in this nature vs nurture film. Even though I was left with a lot of unanswered questions- I loved this movie! The history of the house including the land it sits on was very dark; and the guys who used to hang out here were very bad men, who did very bad things to young Native American girls. INHERITANCE Teaser from Tyler Savage on Vimeo. 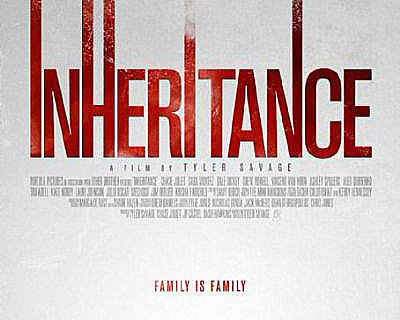 Seeing that I enjoyed Inheritance so much, I was very excited that I got a chance to talk to indie writer/director, Tyler Savage, to find out a little more about this amazing movie! Los Angeles Zombie Girl: Tyler, how long have you been in filmmaking and what made you want to make them? LAZG: You are quoted as wanting to examine your feelings about family and heredity, and did it through this movie. What did you discover about yourself that made this an important story to tell? Did it help you with the worry that you could be defined by the darker aspects of your heredity? LAZG: Where was Inheritance filmed? Is any of the story based on any real history of the area? LAZG: There were many unanswered questions at the end of the film. Can you give us a little more back story? LAZG: Are there plans for a sequel? LAZG: How has the film been doing in film festivals? LAZG: What kind of a budget did you have and how did you get such great people? It looked and sounded like a high budget film! LAZG: I had trouble putting the film in a pigeon hole as far as genre goes. What kind of movie do you categorize it as? LAZG: Was there a favorite part of making the movie? LAZG: What were your challenges while making the movie? LAZG: Was it ghosts or was he just plain crazy? LAZG: Is there anything else you can share with the readers about your process, the shoot, location, actors, etc…. Add together the great cinematography, with terrific acting, a superb script, an awesome soundtrack, edit it beautifully and you have a film that is sure to win lots of awards! I recommend this movie!! It is a mystery that unfolds, but not all the way, leaving you room to make your own decisions and to also analyze some of your own personal feelings about family. I must admit though, I would love to see that sequel, just to have my questions answered and to learn more about the dark history. Thank you, Tyler, for making this a wonderful tale of madness or ghosts, or is it both? No info on where to see it next, but I’m sure it will be at another film fest soon!